Today, Avaya brings the solution at your fingertips: the Avaya IP Office communications system. Communicate like never before. Respond immediately. Share information, anytime, anywhere, via any device. 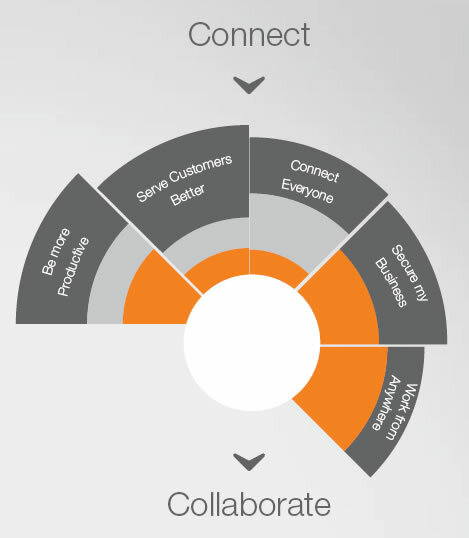 You’ll have the power of a uniﬁed communications system that connects everyone - your people, your customers, your partners. A system that’s incredibly sophisticated, yet remarkably simple to use. Go ahead and grow - IP Ofﬁce is fully capable of handling up to 384 users in a single site. With Avaya, you have a complete, across-the-board solution that brings it all together. From telephony and video to mobility and call centre applications, to networking, security, and on-going services, Avaya IP Ofﬁce will help give your business a competitive edge. Let you do more, with less. Drive proﬁtable growth, without driving up costs. Perform better now and in the future. How can IP Office help your business? An award-winning, small converged PBX that lets you leverage IP, digital, or analogue technology. Be it collaboration, mobility, messaging or device integration, IP Office has the open software environment to make connecting users easy and seamless. IP Office provides a suite of tools including interactive voice response, real time and historic call reports, and voice announcements for queuing calls. Windows-based, menu-driven tools cut the time and expense of administration. Moves, adds and changes are easy and quick. Avaya IP Office flexibly accommodates your choice of devices. It’s really simple to select your user productivity solutions! What is Cisco® Unified Communications Solutions? Cisco® Unified Communications Solutions unify voice, video, data and mobile applications on fixed and mobile networks, enabling easy collaboration every time from any workspace. Cisco Unified Communications Manager Express (Unified CME) provides call processing to Cisco Unified IP Phones for small or branch-office environments. It enables the large portfolio of Cisco Integrated Services Routers (ISRs) to deliver unified communications features that business users commonly use to meet the voice and video communications requirements of the small or medium-sized office. Cisco Unified Communications Manager Express allows you to deploy a cost-effective, highly reliable communications system using a single device with Cisco IOS® Software. What to look for in a unified communications solution? 1. Complete solution that fits your business. 2. Specialized local partners to guide you. 3. Flexible purchase and finance options. 4. Available service and support. 5. Solution backed by a brand you can trust.